Jimmy Bellinger is an actor who has appeared in a variety of commercials, films and, television series including “The Middle” and “Parks and Recreation”. In the newly released film “Blockers” starring Leslie Mann and John Cena, Jimmy plays the role of Chad a nerdy yet confident high school student. Media Mikes had the chance to talk with Jimmy recently about his character and the film and also about his widely popular Skittles commercial. Adam Lawton: Can you tell us a little bit about the film “Blockers” and your character Chad? 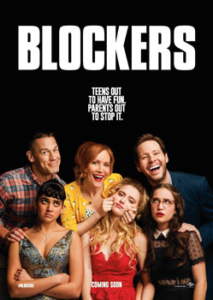 Jimmy Bellinger: “Blockers” is a fun, raunchy sort of coming of age story that follows three parents and their daughters. We first see the girls as young children and then as teenagers getting ready to attend the prom. The girls decide they want to lose their virginity and make a pact to do so. The girl’s dates are not aware that this is set to happen and it turns into this crazy thing when the parents find out and attempt to stop them. My character Chad is sort of a dorky guy but he is very confident. He loves to dance and be a showman. Chad also loves a good fedora! AL: How did this role come about for you? JB: It was actually quite a long process. I auditioned a few times over the course of two months before officially getting the offer. Originally I read for a character that’s not in the story anymore. I then went back and read for the role of Chad. I actually did two auditions that day as they brought me back in the afternoon to read with a group of girls auditioning for the Sam role. None of those girls ended up in the film and I didn’t hear anything for a couple weeks until they brought me back to read with a different group of girls. This whole time I was never really sure if I was going to get the role or not because they could have been seeing other people that I didn’t know about. A week or so later I found out I got the part and also that they recast all three girls and the other two guys. I was lucky that I made it and am very happen that things worked out for me the way that they did. AL: Over that time did the script change in any way? JB: Yes it did. Originally there was this completely different character in the script and that role had been cut out so there were definitely a lot of changes made from the time I first read the script to what ended up being in the film. Things were added and locations changed but the film is still just as funny as when I first read for it and, that was what interested me in the project from the start. AL: Were you allowed creative freedom with the character or were you asked to stay to the scripted material? JB: There was certainly creative freedom. Yes there was a script for the character they wrote but I feel like unless you are playing a real person that existed somewhere in time you bring in pieces of yourself to each role you pay. I feel like most people want you to bring your own traits as an actor to their character. That’s essentially your job. You have ideas and there are scripted pieces so you start there and once you get going you might come up with some other things that help the character and story. The film’s director Kay Cannon is an extremely talented writer so if we weren’t pitching ideas she was coming up with things to try or add. We shot a lot of different versions of each scene so you really didn’t know what will be in the final film until you see it. AL: The film has a very comedic cast. What was it like on set between takes? JB: It was fun! Sets are all very similar because the days are long and when you are not shooting you are hanging out with the other cast and crew joking and having a good time. You get to talk with and meet a lot of different people. The cast was great as were the crew and, being that we were shooting a comedy and not a drama or something really serious everyone was just very relaxed and the mood was light. AL: You also are currently the face of Skittles and appear in the hilarious Skittles-pocks commercial. How did that opportunity come about and, will you be reprising that role in upcoming ads? JB: That came about much like this film through a regular audition. I went in to read for the part and they paired us up randomly with the girls who were their reading for the other part. I ended up being with the girl who also ended up in the commercial. After the first audition I got a call back and I could tell that they liked me because I read with the first girl again as well as a couple others. When we shot it even though it was such a short spot we tried a bunch of different things. The lines were there but I got to have a lot of fun playing within the confines of them. I had no idea what made it into the commercial until it came out. The ad started on the internet and then they started airing it and then they stopped. That usually happens after some time with commercials but then they decided to renew it and it has been playing non-stop. I am completely fine with it. Some people think it’s funny; some people think its gross or a combination of the two. I think that they are probably all right but I think that’s kind of the appeal of it as it’s weird but quick and easy. It’s just crazy how big it has become and seeing how excited people get amazes me. In terms of reprising the role that really on them however I will happily be paid to wear more skittles on my face. I am fine with that. AL: Are there any other projects you have been working on that you would like to mention? JB: There are some things in the works but I can’t really talk too much about those right now however, I did do an episode of the Nickelodeon show “Night Squad”. My episode won’t air until Halloween time but I do want to let people know it will be coming out and when they can look for it. Great interview Adam. Nice snag!